A quick post for you as I've had a few friends asking me about this. I'm as fanatical about SPF as I am about chemicals in skincare and it's a difficult balance to strike at this time of year because many sun creams are loaded with chemicals - so much so, there's a line of thought that says the chemicals in the long term are worse for you than the sun exposure. I personally think it's a bit like comparing apples and pears. They're both dangerous - in different ways. I look for 2 things in a facial SPF cream - it has to have a low level of chemical ingredients - the ideal would be no chemicals at all but that does mean the price goes up - and it has to work under make-up because I want to wear it every day in the summer months, not just the hot sunny days...I want it essentially to work like a daily moisturiser so that it's not a chore to put on every day and I'm not layering more than two products on my face (moisturiser and foundation). Here are the ones I've personally tried and tested. All good in their own way but some better from an ingredients point of view and some better from a daily wear under make-up point of view. Taking the image left to right..
Antipodes Immortal SPF 15 - made in New Zealand, this natural product was my autumn/winter cream of choice after finding it in my local natural food store at half price. SPF15 is perfect for the winter months and this cream has completely natural ingredients, is fragrance free and gives a great base for make-up. Easy to absorb and no white face. The only thing that would stop me buying again is the price...but I'll definitely snap it up again if I find it reduced. 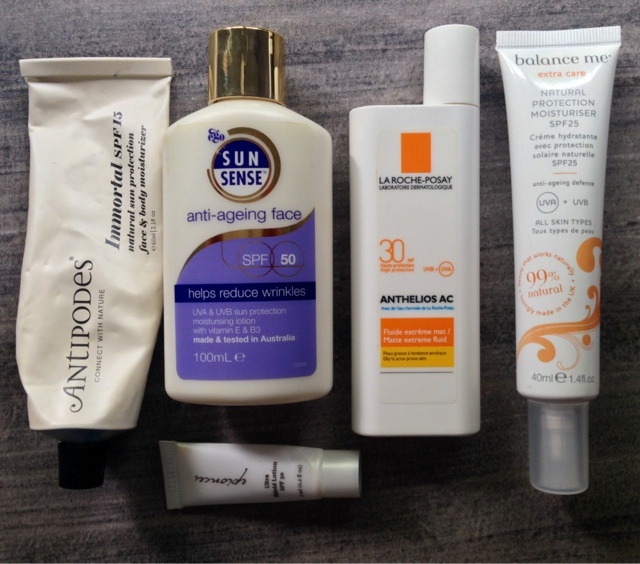 SunSense Face Anti-Ageing SPF5 50 - my blogging friend Nic from Strawberry Blonde Beauty Blog gave me this last summer and it's another great option for under make-up as it soaks in quite quickly and doesn't make the face all white. It's not as chemical free as I would like so I alternate this with other creams but I use this on very hot days where I know I'll be in the sun all day as it's rock solid from a protection point of view. La Roche Posay Anthelios SPF 30 - I discovered LRP a few years back and was attracted by the fact that the products are low in chemicals but still offer superior protection. LRP are renowned for their extremely gentle skincare - suitable for the most sensitive of skins, so as a consequence, this cream is ideal for anyone who gets heat rash from suncreams. I mostly use this on on the kids' faces as it doesn't make their eyes sting. From a grown-up perspective, LRP gets top marks for not making the face too white and the lotion soaks in well, allowing make-up to be applied immediately afterwards. Comes in a range of formulations for acne prone skin/normal skin etc and also comes in an SPF 50 which I've found works just the same as the 30. I prefer the lotion texture that comes in this shaped bottle but you can also get a richer cream texture in a tube. Balance Me Natural Protection Moisturiser SPF25 - in terms of ingredients, this is a brilliant option. This chemical free formulation in a high SPF is great but the price you pay is that it does make the skin white on application and takes a while to soak in. I also find this a little greasy for my skin for daily use but it would be great for drier skins. It's also a real hit with the kids as it smells so lovely and doesn't irritate the eyes. Epionce Ultra Shield Lotion SPF 50 - and this is the creme de la creme...and proof that you get what you pay for. If you can afford this lotion (note that mine is just a sample! ), I can't recommend it enough. It's a joy to use, beautiful texture, provides a lovely base for make-up, no white face and it's free of parabens and fragrance. Once I've worked my way though my LRP and SunSense, I'm going to invest in this. I got my sample from the Destination Skin concession in House of Fraser Belfast - there are Destination Skin salons all over the UK so if you have one near you, it's worth going to ask for a sample of this amazing cream. Incidentally, the Dermaquest range is also very impressive and if you have sun damage to your skin already, definitely go check out their antioxidant VitC serum - it's a miracle worker! I know there are loads more great facial SPF's with natural ingredients out there but I wanted this piece to be about recommending what I know and use daily rather than products I've never tried myself. So please do share in the comments what works for you - it would be great to get more recommendations. I've recently discovered La Roche-Posay & are loving their products Avril, so much so that I've changed my whole skincare routine over to their products including this suncream.....just wish I'd discovered them years ago!